The Lighten Up Cookbook | Free eBooks Download - EBOOKEE! Posted on 2018-05-21, by perica123. 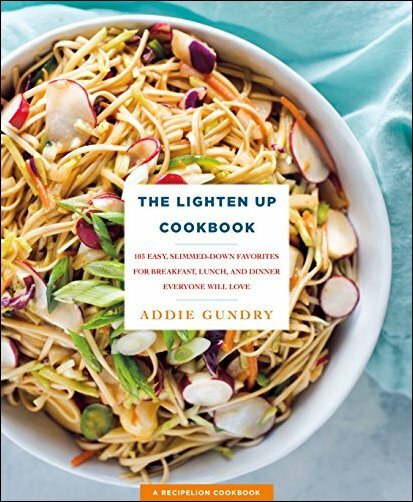 Classic American dishes get a lighter makeover in The Lighten Up Cookbook by Cutthroat Kitchen star Addie Gundry, from nutrient-rich smoothies to easy family dinners to guilt-free desserts. Eating lighter doesn't have to include charts or calorie counting. By incorporating easy healthy recipes into your diet, like substituting cauliflower for starchy breads or baking chicken instead of frying it, you can revitalize your eating habits without giving up the foods you love. From light breakfast recipes like the Kale Smoothie to potluck favorites like Mayo-Free Chicken Salad to family dinners like Zucchini Lasagna and even sweet treats like Pineapple Fluff, eating healthier can be simple and tasty! Each recipe is paired with a gorgeous full-color finished-dish photo. No comments for "The Lighten Up Cookbook".